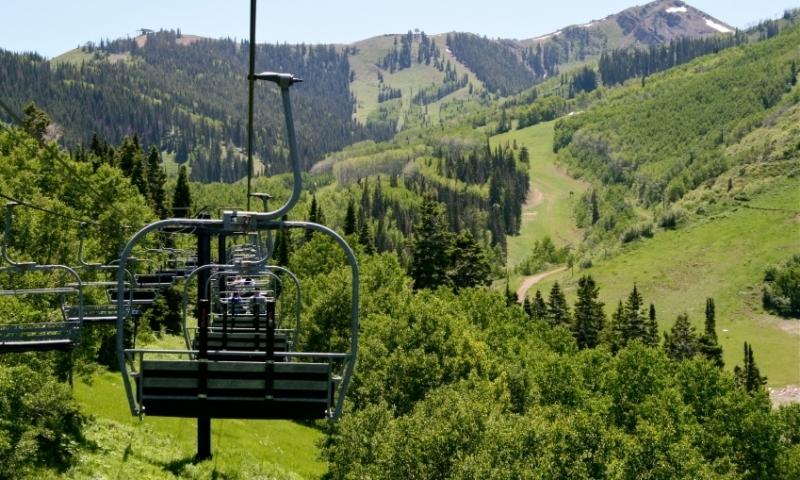 Most Park City resorts operate summer lifts to bring visitors up the mountain, where they can hike around the trails and have a mid-mountain lunch overlooking the valley, all before riding down to town. Park City chairlifts take visitors from Main Street to Mid-Mountain in just minutes. Ride the Red Pine Gondola at The Canyons, where the Red Pine Cafe serves lunch with a view. Try the Aerial Tram or Peruvian Express at Snowbird and head to Mineral Basin, found at the end of a 600-ft. tunnel. Everyone can appreciate a mountain view, looking over the forests and mountains from a towering height. The problem is that trees or buildings can often block the scenery. In a gondola or on a chairlift, however, the lift is above the trees and views stretch around in a 360° panoramic. Another benefit of a lift is that it puts visitors in the middle of the mountain without the grueling work of hiking up. They are already halfway up, leaving time and energy to explore the hiking trails on the mountain itself. For mountain bikers, be sure to ask about taking the bike with you on the lift. Resorts will often allow bikes to be taken to the top of the lift, where biking trails are plentiful. Head up the mountain from the historic Main Street in Park City by hopping on the Town Lift. From the Park City Mountain Resort, head up the PayDay Lift to access the Mid-Mountain Trail, the alpine slide or the many other summer activities. Location - The PayDay lift starts from the resort base on Lowell Ave., while the Town Lift starts on Main Street in Park City. Hours - The schedule varies according to season, but the lifts are in operation during summer weekend afternoons, and weekday afternoons during peak season. Cost - Day passes cost $24/adult, $21/junior (5 to 12), Free (under 5 but must be able to walk). Hop on the Red Pine Gondola to take the stunning ride to 8,000 feet altitude. The Park City gondola puts visitors in the middle of the mountain, where they can explore mountain hikes through the summer meadows and have lunch at the Red Pine Cafe. For those who are familiar with The Canyons, the 2010/11 season brought some changes, notably the Flight of the Canyons Gondola being repositioned from the Grand Summit Hotel to the area near Ski Beach. In conjunction with the move, the gondola was renamed the Red Pine Gondola. Location - The gondola starts by Ski Beach at the base of the resort, just north of Park City. Hours - The gondola is open daily from 10am to 5pm during the peak summer months of June through September. Cost - Adults are $24, while children 12 and under are $21. Children (older than 2 smaller than 48") are $7. Just 10 minutes on the Aerial Tram is all it takes to go from the Snowbird Center to the top of Hidden Peak at 11,000 feet elevation. Hike around the top, or simply enjoy the views from this incredible vantage point. The Peruvian Express Lift also runs in summer, accessing Mineral Basin through a 600-foot tunnel. Waiting on the other side are horses, ATVs and miles of trails to explore. Location - Both the Aerial Tram and the Peruvian Express Lift start at the Snowbird Center, located in Little Cottonwood Canyon on UT-210. Hours - The tram runs from 11am to 5pm from June through Labor Day. Cost - Single rides are $20 for adults and $17 for children 7-16 years old and seniors 65 and over. Head up the Silver Lake Express to find yourself at the Royal Street Cafe, set in the hub of the Deer Valley hiking network. While there, take the option to continue onto the Sterling Express Lift to reach 9,400 feet. Location - The Silver Lake Express goes from the Snow Park Lodge to Silver Lake Lodge on Bald Eagle Mountain. The Sterling Express starts at Silver Lake Lodge and heads to Bald Mountain. The resort is in Park City, up Deer Valley Dr. from UT-224. Hours - The Silver Lake Express and Sterling Express are open daily from late June to Labor Day. Cost - Rides up the chairlift cost $20 each or $45 for a day pass. Heading up 1,000 vertical feet, the Sunrise Lift at Solitude will put you in the middle of the mountain, where you can get out and stretch your legs on the trails before hopping back on the lift for a ride down. Location - The Sunrise Lift is located at The Village in Solitude, found on Big Cottonwood Canyon Road. Hours - Starting at 1pm on Friday and 10am on Saturday and Sunday, the lifts stop running at 6pm. Cost - Single rides are $12, and all-day passes cost $20. Children 6 and under ride free. The panoramic view from Ray's Summit are significant rewards for taking the scenic chairlift ride. There are hiking trails to explore, and benches to just sit and enjoy the quiet landscape. Sundance also offers Full Moon Rides when the time is right. Location - The ride starts from the resort base, located past Deer Creek Reservoir on UT-92. Cost - Adults are $15 and children from 6 to 12 year old pay $13. Full Moon Lift Rides cost $17/adult. There are discounts for multiple rides. Rising 2,310 feet from the Grizzly Center at the resort base, the Needles Express Gondola takes visitors up to Needles Lodge at 8,716 feet. The eastern facing slope access a number of hiking trails, as well as the full-service restaurant near the summit. Location - The gondola ride starts from the resort base, located on UT-226 from UT-167, which can be reached from I-84 Exit 96. Hours - The gondola generally runs from 9am to 6pm on summer weekends, with some exceptions during peak times. Cost - Adults are $14 and youth (7 to 17) are just $10. If bringing a bike, the prices are $25/$20.